The Society of Manufacturing Engineers (SME) named Professor Ala Qattawi one of this year’s Outstanding Young Manufacturing Engineers. Since 1980, the SME has conferred the Outstanding Young Manufacturing Engineer Award to manufacturing engineers age 35 or younger who have made exceptional contributions and significant accomplishments in the manufacturing industry. 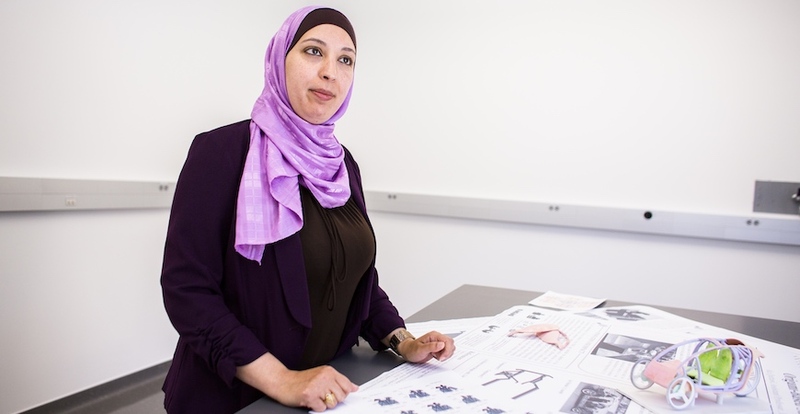 Qattawi, the first woman in the United States to earn a Ph.D. in automotive engineering and the only automotive engineering professor at UC Merced, runs the Innovative Design & Manufacturing Lab at UC Merced. Her research focuses on design and manufacturing with an emphasis on intelligent manufacturing systems, modeling and optimization of part design, and sustainable design and manufacturing processes. Her lab has developed Origami-inspired manufacturing processes for sheet metal that reduces machinery and energy needs. Qattawi has been an SME member since 2016. Founded in 1932, SME works to advance and advocate for North America’s manufacturing industry. Key areas of focus for SME include the state of manufacturing, advanced manufacturing technology and the manufacturing workforce.